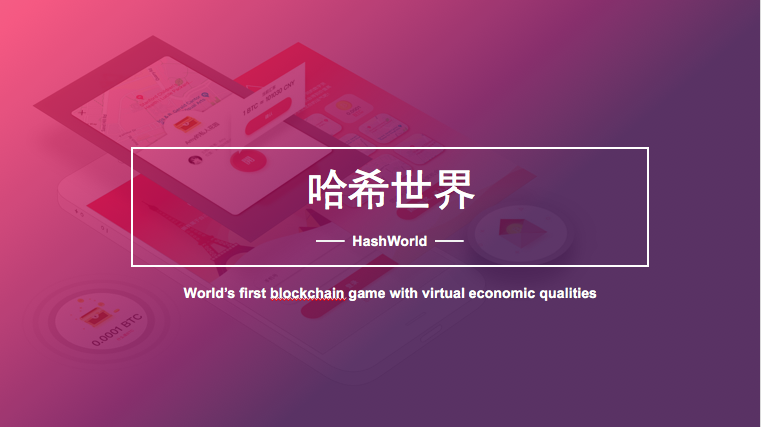 Popularize blockchain knowledge with gamification, HashWorld received $2 million Pre-A round finance from Will Hunting Capital and Wecash Ltd.
Today, Yinghao Jia, founder of HashWorld disclosed to ilieyun that the company had won $2 million finance from Will Hunting Capital and Wecash Ltd. At present, HashWorld’s A round of financing is also in progress. Since its launch in January 2018, HashWorld has received nearly one million dollars angel round investment from Danhua Capital. Recently, blockchain games have emerged in an endless stream, most of which are similar to the CryptoKitties, with a growing homogenous tendency. HashWorld hopes to educate junior users about blockchain knowledge and digital currency through gamification. On November 28, 2017, the blockchain “Crypto Cat” CryptoKitties was born. In the next 3 months, there will be a new blockchain game going online every day. Jia said that HashWorld was indeed inspired by CryptoKitties, however, the team believed that the single game play of buying and selling cats would hardly attract users to stay active, and that most of the follow-up games lacked originality. It is true, some blockchain games have already declared shut down. HashWorld is a blockchain game platform. Its game type is similar to “monopoly.” Users can obtain a certain number of digital assets by flipping cards in the virtual world, bidding for iconic buildings around the world. Users who win the auction can freely design slogans on their land. At present, the HashWorld currency HSC is only a utility token circulated in the game and cannot exchange with other digital currencies. The HashWorld distributes 4 kinds of digital currency in its platform, such as Speedcoin SWFTC, Yereco ELA, Bitcoin BTC and Ethereum ETH. At this stage, users can enter the game through WeChat official account, and the global version has also been released for overseas users. Jia told us that various types of products in HashWorld are being developed as planned, and the HashWorld App is being reviewed now. The upcoming App will access the Baidu Maps API, building up a 1:1 virtual parallel world game map with the real world. At the same time, the LBS mechanism will be set up. After users purchase a virtual land, whenever other users play games at that location in the real world, the landowners will take a certain percentage of their income as “rent”. The withdrawal ratio is 10%. The function of buying and selling virtual land in HashWorld is based on Ethereum Smart Contracts, including the generation of random numbers (after the land auction, a mechanism similar to the “license-plate lottery”), recording and transferring of land or other values. In 2016, Yinghao Jia did his summer internship in a VC company in Silicon Valley, US. During the two months, he investigated many blockchain related companies. Since then, Jia discovered his deep compassion in blockchain technology. Back on campus in Tsinghua University, Jia set up the Student Blockchain Association and now serves as the president. Later, he joined the Blockchain Association in North America as a founding member and is now a senior researcher. The Blockchain Association, which Jia founded at the university, often held panel talks to share with Tsinghua alumni about blockchain technology. However, he soon realized that the offline sharing activities had limited influence, and he came up with the idea of ​​making it online. Jia told ilieyun that HashWorld adopted the form of Mobile HTML5 design in the initial stage to reduce the entrance cost of junior users. Users can directly enter the game by clicking on the WeChat official account or the web browser link. During the game, they understand what blockchain is and where high quality blockchain projects are. HashWorld has specially developed the “blockchain knowledge” section. Recently, it has also jointly published the “blockchain dictionary” with experts in the industry. A series of industry research reports will be launched in the later on. HashWorld is about to release the blockchain quiz function to motivate users to learn relevant blockchain knowledge, Jia revealed to us. 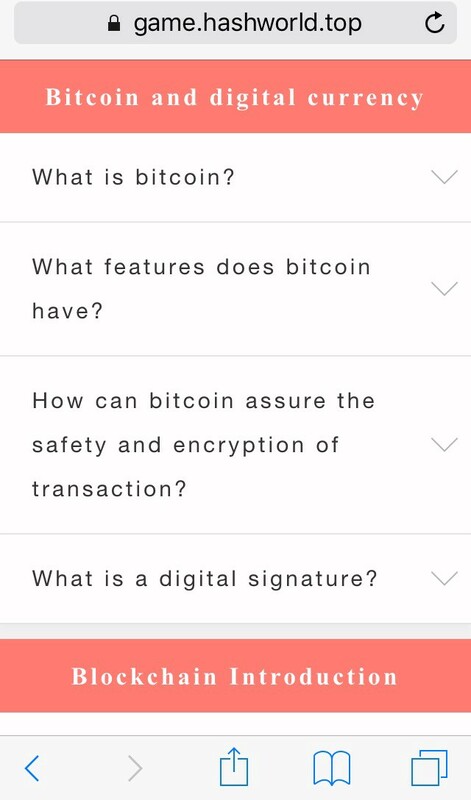 Users can obtain corresponding digital currency rewards by answering questions. At the end of 2017, after gaining his supervisor’s approval and support, Jia suspended his PhD study and fully devoted into HashWorld entrepreneurship. Currently, HashWorld team has more than 20 members, with half of the staff to be technology and development experts. According to Jia, thousands of users registered on the day HashWorld launched and reached the breakthrough point of 10,000 users in 36 hours. At present, the number of users has exceeded 400,000 without launching paid promotion on media channels. Jia said that advertising sponsorship is the main source of revenue for HashWorld at this stage. At present, the company has achieved positive cash flow. The digital assets users obtained in the game are provided by the partners. To a certain extent, HashWorld presents advertisement for its partners, in the meantime, it also helps in user conversion for them. Founder of @HashWorld. Senior researcher in North America Blockchain Association. Entrepreneur, problem-solver, public speaker.